town centres christmas tree facing church street ? why is the towns christmas tree at the back of christ church facing church street it would make more sense to have it in church square in front of the church Maybe one of the councillors can explain why. Re: town centres christmas tree facing church street ? 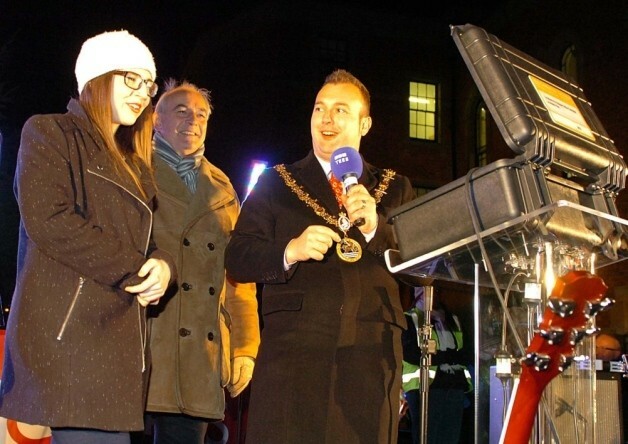 They can't have it in Church Square, won't it block the view of the local politico's being photographed with the minor celeb they've paid to flick the switch for the Xmas lights? How much are they splashing out this year, bearing in mind the 'cuts' they go on about, unless of course they're doing it for nowt! A Xmas tree in Church Square would have been the obvious, logical and fitting location. Sadly, those qualities are in short supply. Do we have no one locally who could switch them on? How much is the soap 'star' getting paid? I expect the local dignitaries will also be there, having been driven down from their headquarters. Unless they take the chance of using the pedestrian road crossing to Church Square. Do you begrudge the child his 10 seconds of fame with 4th rate 'Celebs'? Look at his face, I bet he didn't get this excited when he was waiting for Santa! Suspicious protuberance in his coat though. Something is straining at the leash! It is to celebrate the refresh of Church Street. Just like in previous years they had it at Historic Quay to welcome the arrival of the Navy Museum. It deffinately going to look superb looking up Chuch Street with the tree as the focal point looking up from the bottom. Reminds me of when Billy Bunter used to say "Pharrrww"
'Superb'? Looking up Church Street? Why, will the shops be stocked with 'Winter Faryre' and recreating some Dickensian Xmas scene? No, it'll still be bars and kebab/pizzas and empty shops and the 'merry' users of Church Street will hardly be bothered about where the Xmas tree is. For those familiar with the film 'Wonderful Life', they'll know what I mean when I say the Church Street reminds me of Pottersville.